Writers’ Trigger: Do you ever read the obituaries? It probably depends on your age. The older you are, the more interest you take in obituaries and tombstone inscriptions. Many obituaries indicate the ways in which the deceased made his mark. Visit a nearby cemetery and copy a few inscriptions that appeal to you. Or… many parks have memorial benches with a small brass plaque – Something like “In memory of Edith whom I met on a park bench.” Once you have your inscription, start your poem or prose piece with that inscription. Writing your own obituary is an interesting exercise. Check your local paper first to review the format. Choose an obituary at random, and build a story based on the deceased. Jim Bishop is a local institution in Custer County, Colorado. Those who have not met him personally, know his work: he has left his mark- a mark that some 6,000 people visit annually. 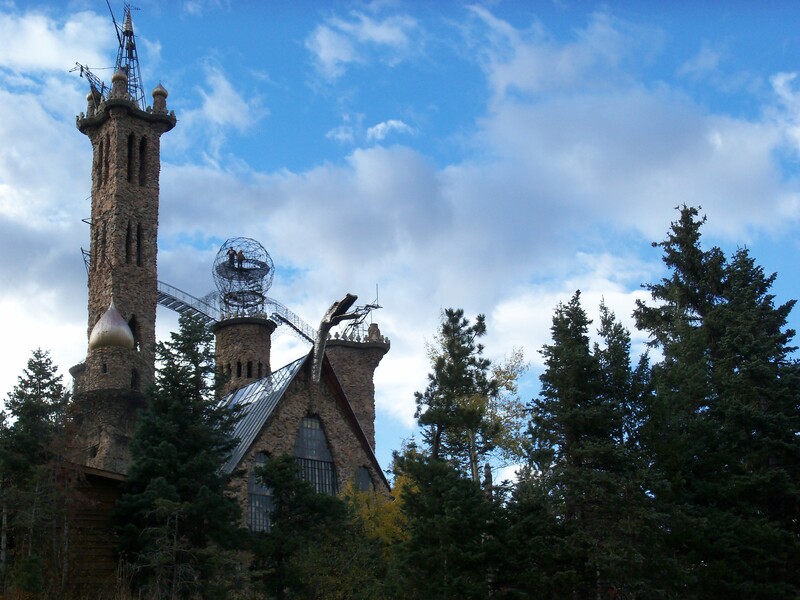 Bishop’s Castle is 13 miles south of the intersection of Colorado State Highways 96 and 165. Some think that Bishop is a little bit crazy. Almost everyone would agree that he is obsessed. His biggest problem is that he’s different. Heaven forbid that anyone deviates from the norm. He’s certainly not like the rest of us with our 9-5 jobs, our lawn mowers, our two-week annual vacations, and our lock-step little lives. In 1969 Bishop decided to clad his family home in stone. A neighbor suggested that Bishop’s home was beginning to look like a castle. And the seed was sown. The years have passed, and the castle has grown to Hogwarts’ proportions. And you are thinking, so… this doesn’t sound so crazy. Well, what I haven’t mentioned is that Jim Bishop has built the castle by himself. On his own he has collected 1,000 tons of roadside rocks. Once Bishop has a load, he takes them home and sets them in place – at which point he tacks them together with cement and his fanciful, trademark ironwork. Many Americans are looking for smaller government. My guess is that Jim Bishop wants no government. As the builder/owner of a castle, Jim Bishop has the arrogance of a castle owner. He marches to his own drummer and has no truck with anyone in an official capacity. The state had an issue with his collecting roadside stones in the surrounding national forest, and in 1998, the county had an issue with his holding raves at the castle. As for his building to a uniform building code… you’ve got to be kidding. The dragon – see the figurehead in my photo- breathes fire. Future plans include a moat, a drawbridge, and a roller coaster mounted on the castle’s outer wall. 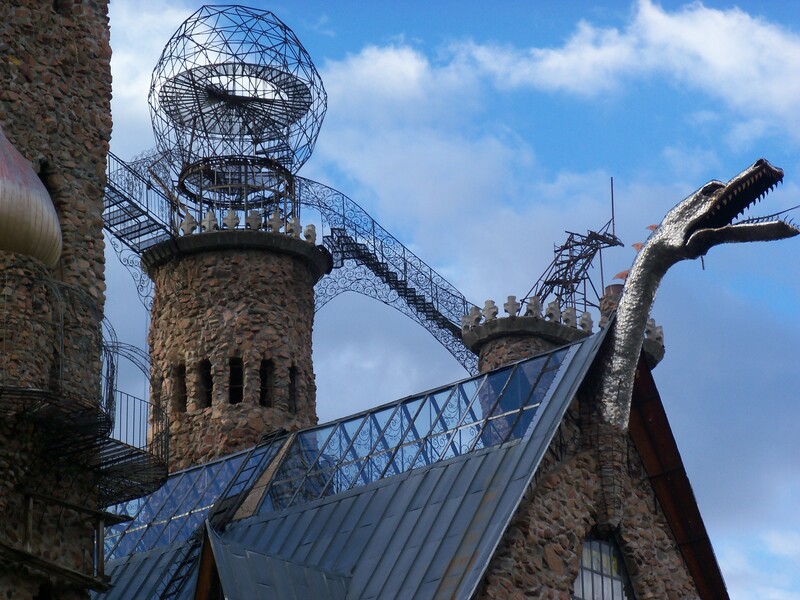 If visitors run in the mesh dome at the top of the castle, the dome will rotate.